Endeavour debuts tonight on PBS at 9 p.m. Eastern and Pacific, 8 p.m. Central and Mountain in most markets. You should check local listings. The basic question facing Endeavour is whether its title character—far better known as the future Inspector Morse—can or should exist independently of his original, iconic portrayer, the late John Thaw. Admittedly, the character was originally the creation of crime novelist Colin Dexter and, as such, his literary incarnation does predate Thaw and the Inspector Morse television series, which aired 33 episodes between 1987 and 2000. And yet, to most people familiar with the character, Thaw is Morse and, just as importantly, Morse is Thaw. The task of this prequel series then is to drill down to Morse’s underlying, fundamental traits, to find what defines the character beyond one actor’s inimitable performance. For Endeavour to work, Morse has to take his place among those titans of the detective genre who transcend the actors who play them. To illustrate that point, who portrayed the definitive Sherlock Holmes? The simple fact that there’s at least a handful of defensible answers to that question speaks to the character’s evergreen status. Morse is a long, long way from such immortality, but for Endeavour to work at all, it needs to represent a first step in that direction. The first season of Endeavour—following on from last year’s standalone premiere episode—picks up the action in the city of Oxford in 1965. Detective Constable Endeavour Morse proved his integrity and potential as an investigator in the pilot movie, and he has earned a place as bagman to the chief of Cowley Police Station’s Criminal Investigation Division, Inspector Fred Thursday. This honor affords him a chance to learn under the tutelage of Oxford’s most capable and distinguished police officer, but it also further alienates the fiery, openly educated Morse from his colleagues, who believe bagman duties should have gone to someone more senior rank. Tonight’s case finds Morse and Thursday investigating the mysterious death of a young woman of an inexplicable drug overdose. In keeping with a tradition established by over two decades of Inspector Morse and its follow-up Lewis, this initial death soon leads to contact with a powerful, corrupt family with ties to Oxford University, not to mention a whole bunch of additional dead bodies. “Girl” leans heavily on the iconic elements of Morse’s character to drive its plot, which is true of the season in general. This particular story revolves around Morse’s love of crosswords and cryptograms, and the episode explores his greatest weakness as an investigator, specifically his tendency to dismiss beautiful, vulnerable women as potential suspects. The latter element feels especially vital, as it’s still early enough in his career that the bad habit hasn’t yet formed; rather, the decisions Morse makes here will shape his future, and he has none of the later perks of seniority and a brilliant record to protect him from his own shortcomings. His recklessly gallant treatment of a young woman struggling with epilepsy threatens to ruin his career, even if he does act with what could plausibly be considered the best of intentions. Those familiar with Inspector Morse—and that’s likely a healthy chunk of Endeavour’s viewership, although it’s certainly possible to watch this series with no knowledge of its predecessors—can likely predict where the young Morse will make disastrous mistakes and where he will ultimately triumph. Besides, there can still be consequences to his decisions that don’t specifically conform to what’s known of his later life; the 22-year gap between this show and the start of Inspector Morse provides a vast gap in which Morse has plenty of time to make potentially career-destroying mistakes and still eventually recover. As such, while Morse’s long-term fate is set is stone, there are no guarantees of what might happen to him in the immediate future. One investigative blunder in particular is clearly reminiscent of the sort of mistake John Thaw’s Morse would make on multiple occasions, and it’s actually in that moment where this young Morse most strongly connects with his past and future self. This is all especially important because Endeavour star Shaun Evans isn’t trying to imitate or replicate John Thaw’s performance; indeed, the two men don’t really look or sound much like each other, although Evans does incorporate some of Thaw’s body language into his own portrayal. All that isn’t exactly surprising, as Thaw’s Inspector Morse was so quintessentially middle-aged in his character and his mannerisms, as though he had sprung into existence fully formed at the age of 45. As such, it’s difficult to really imagine what that Morse would have been like as a young man. The inspector’s irascibility and his underlying, hard-earned misanthropy wouldn’t make much sense if demonstrated by someone so young and inexperienced. Evans captures the qualities that Morse might plausibly have had in 1965; he barely conceals his contempt for the university society that rejected him—or, more accurately, he rejected—and he never compromises in pursuit of the truth, no matter the cost. He creates a young Morse that can coexist with Thaw’s older version, even if it’s difficult to imagine how one’s appearance could plausibly morph into the other’s, even given a couple decades. Far more importantly, Evans creates a character who is an effective, formidable lead for this particular series, and that will be far more important to both the show and the character’s future in the long run. Still, it must be said that the show’s heavy use of cryptic clues can verge into gimmick territory. A shockingly high percentage of Oxford’s murder cases in 1965 apparently involves solving elaborate, convoluted riddles; indeed, a later episode goes a step further and builds these clues around opera, another of Morse’s great loves. This storytelling approach can stretch credulity—yes, even more so than the franchise’s longstanding implication that every Oxford professor has either murdered, been murdered, or committed some unspeakable act that prompted one of their students to murder people—but this is perhaps forgivable on the grounds that it frequently makes for highly entertaining, if rather preposterous television. Plus, the heavy use of such clues actually provides a moderately sane explanation as to why Morse can consistently crack cases that his more experienced superiors cannot. Ultimately, such clues are part of what make Morse unique, even if they are more in the foreground here than they were on Inspector Morse. Endeavour crucially links this riddle-solving with Morse’s formidable powers of observation, which he shows off more readily here than he does in Inspector Morse. That makes perfect sense in context; in 1965, he is still trying to prove himself to his skeptical colleagues, whereas by the late ‘80s he has long since demonstrated his investigative acumen, and there’s no need for him to constantly explain his thinking to others. Morse isn’t yet at a point where everyone takes his brilliance—or, more accurately, the usefulness of his brilliance—for granted. That leads to the most intriguing question posed by Endeavour, one that even longtime Inspector Morse fans might well debate. It’s suggested in “Girl” that Morse is a brilliant detective but a lousy cop, and he’s going to have to work on that deficiency if he hopes to make something of himself. This series suggests there really are some astounding gaps in Morse’s knowledge of the finer points of the law, and he’s flummoxed by things here that his later self would probably have avoided. But that “probably” matters, because it really is arguable whether John Thaw’s Inspector Morse ever properly fixed this particular flaw. Even at the height of his powers, Morse was always indifferent to the finer points of being a cop; he has always been a latter-day gentleman detective, someone who, had he lived in a different era, would likely never have bothered with the trouble of getting a badge and just gotten on with the business of solving murders. Exactly why he became a cop—and whether he really has the temperament to become a police officer, rather than just a detective—is key to understanding why Morse, whatever the time and place, is Morse. That should be more than enough for Endeavour to explore. 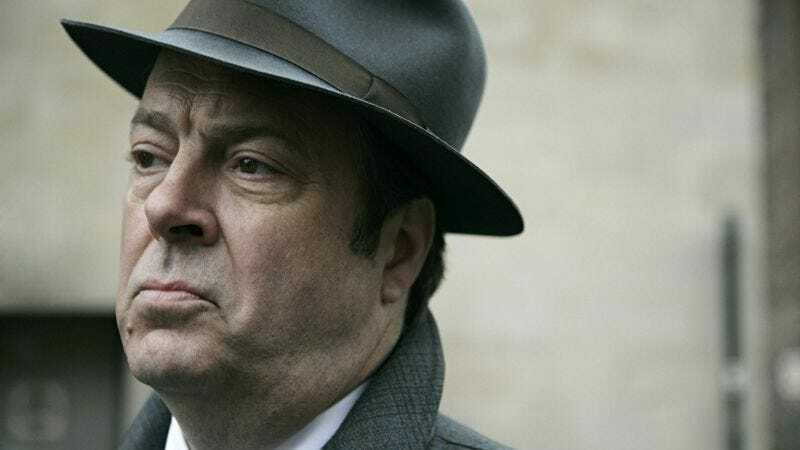 He doesn’t get quite so much to do in this particular episode, but Roger Allam is reliably great as Detective Fred Thursday. He portrays Morse’s brilliant mentor with just the right level of integrity, offering a virtuous example of an old-school cop without ever verging into saintly territory. Indeed, there’s some carefully managed darkness underlying Allam’s performance that becomes clearer in subsequent episodes. As a bonus, it seems particularly apt that Allam would be the second lead in a show called Endeavour, as his first appearance in the Morse franchise was in 1997’s “Death Is Now My Neighbor,” which was actually the episode that revealed Morse’s long-concealed first name. While the show wisely gives Shaun Evans plenty of room to create his own interpretation of the character, it clearly has a lot of fun with the casting of the other two legacy characters. In particular, James Bradshaw’s Dr. Max deBryn, the flamboyant pathologist, is a dead ringer for Peter Woodthorpe’s performance as the character in the first couple seasons of Morse. Sean Rigby also offers a strong, solid presence as the younger, uniformed version of James Grout’s Chief Superintendent Strange. This particular episode goes relatively light on the in-jokes and references to Inspector Morse, especially compared to the standalone premiere, which actually incorporated a brief quasi-cameo from John Thaw himself. There are far more such homages in subsequent episodes, including the introduction of a character who rather obliquely but pointedly addresses the lack of resemblance between Evans and Thaw. Here’s the real, rather dumb question—will Endeavour resist the temptation to feature a cameo from a teenaged Robbie Lewis? Since the character should still be safely up in Newcastle at this point, I can’t imagine he will show up, and the series seems better than that anyway. But I wouldn’t hate it if the show eventually did that in its finale or something.